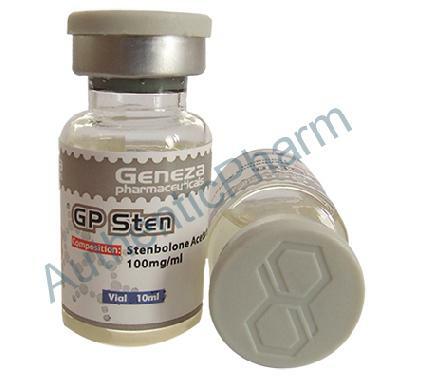 GP Sten is an injectable steroid which contains 100mg/ml of the hormone Stenbolone acetate. Stenbolone was introduced on the market in 1963 by Syntex, the that produced the popular steroids Anadrol, Oxitosona (o.c. ), and Anapolon. It is therefore not surprising that Stenbolone has an application similar to the other three compounds. Syntex developed Stenbolone as a mild alternative to the toxic same company Anadrol. And the company was successful because Stenbolone is neither liver-toxic nor does it aromatize, and it is only slightly an-drogenic. In addition, it has a similar effect to Anadrol in cases of anemia with abnormal blood formation since it increases the num-ber of red blood cells. For this reason Stenbolone is especially suit-able for competing athletes since it accelerates regeneration when dieting. Competing body builders in the weeks before a champi-onship often experience a catabolic phase and a condition of over training. Stenbolone rapidly and reliably counters this and helps to obtain a good form since it does not draw water and does not increase the estrogen level. For the buildup of strength and mass, however, Stenbolone is by far not as suitable as Anadrol, although some erroneously call it an injectable Anadrol. Stenbolone has lower anabolic and androgenic effects than the oral version and it leads to a slow but solid muscle gain along with a moderate strength gain. For this purpose it is preferred by women and ste-roid novices, and by older athletes who obtain satisfying results without the fear of significant side effects. Despite this, Stenbolone is, above all, I a competition steroid which is confirmed by the American "Steroid Guru" Daniel Duchaine in his book Underground Steroid Handbook 2: "This is an excellent steroid to use while dieting..." Since the substance is in acetate form it has only a low half-life time so that frequent and regular injections are necessary in order to ob-tain sufficiently high and constant blood level values. For optimal results Stenbolone is normally taken daily and injected at least ev-ery 2 days. The usual weekly dose for athletes is 200-300 mg. For this reason the 50 mg strength is often preferred and the athlete either injects the entire one-milliliter ampule daily or limits the use to half of it. Women normally do well with 100- 150 mg/week and should divide their weekly dosage into three equal parts. The poten-tial side effects are low since the compound is well tolerated by the liver and edemas, gynecomastia, and high blood pressure do not occur. Cases of acne and increased aggressiveness in men are low and rare, as is a reduction in the body's own hormone production. Virilization symptoms in women also occur rarely and for the most part in very sensitive persons when high dosages are given or when the intake interval lasts over several weeks.